Many good books and information are available on the Pomeranian. The following is just a quick account of the Pomeranian, although the page will be updated on a regular basis. 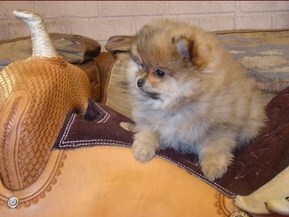 Any Pomeranian puppy is a commitment for an average of 12 to 15 years. Please visit our other informative pages linked below. The most common known history of the Pomeranian is that this Northern Spitz breed was named after a German province named Pomerania. Poms have a sledding and guard dog background. The modern Pomeranian is descended from Queen Victoria challenging British breeders to breed the Pom into a smaller toy version from its 30 to 40 pound size in the late 1800's. She had been introduced to these charming dogs from her German aunt, Queen Charlotte, returning from Italy in 1888 with some. However, there are depictions of similar dogs in ancient Greece tombs, vases and drawings. The Northern Spitz family includes dogs such as the Keeshond, Norwegian Elkhound, Samoyed, Alaskan Malamute and the Siberian Husky. Although each country has its own Pomeranian breed standard, the most common here is the Canadian Kennel Club version. This is a short piece taken from the CKC Breed Standard: "The Pomeranian in build and appearance should be a compact, short-coupled dog, well knit in frame. He should exhibit great intelligence in his expression, docility in his disposition, and activity and buoyancy in his deportment, and be sound in action. There should be two coats, an under and an outer coat; the first a soft, fluffy undercoat, and the other a long, perfectly straight and glistening coat covering the whole body, being very abundant around the neck and forepart of the shoulders and chest where it should form a frill of profuse, standing-off, straight hair extending over the shoulders. The hindquarters should be clad with long hair or feathering from top of rump to the hocks. The texture of the guard hairs must be harsh to the touch." Average breed sizes are from 3 to 7 pounds. There are actually 13 different Canadian recognized coat colors: orange, sable (orange, wolf, cream, blue & red to name a few), cream, black, parti-colored, black & tan, blue, chocolate, red, white, beaver, brown, etc. An adult Pom is a big dog in a little dog body. They have the emotional needs of a three year human toddler and the intelligence of a 15 year old human teenager. They have individual personalities just like people. Neutered males seem to make better pets, although of course there are plenty of wonderful female pets as well. Poms are fine with children and other pets under supervision when properly trained, socialized and raised in a family home environment, as they are very social by nature. 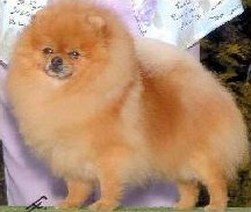 Depending on the size, most Poms enjoy a backyard, although apartment living is suitable when supplemented by recreational time like going for walks. Pomeranians are considered part of the Toy group and should be treated as such. Their heads, legs, and joints are susceptible to injury. They are small and require access to fresh water and dry food AT ALL TIMES. They need frequent brushing with slicker and Pin brushes. Nails should be clipped about every two months, but this varies with the dog. Poms have small teeth and need regular dental care, whether brushing every day or using a dental product such as Petzlife to remove plaque (very easy). Shedding or blowing out their coats occurs a couple times a year, usually in Spring and Fall. Poms shed in clumps, which makes them easier to clean up with around the house and more hypoallergenic than many breeds. Females shed more than males. Adult Poms should be bathed about every four months as frequent bathing destroys the coat hair and protective oils. Under NO CIRCUMSTANCES should a Pom ever be shaved. This will generally destroy the coat to the point where it will not grow back or properly. Aside from deworming and travelling, Poms should only be vaccinated every two to three years. The American Veterinary Medical Association has changed its protocols as research has proven that more frequent vaccination has led to auto-immune disorders, cancer, vaccinosis and reactions to vaccines. Poisonous foods that should not be given to your dog include grapes, raisins, onions, and of course chocolate. Unfortunately no breed is perfect. Again these are very simplified explanations, and more information is provided in depth in many books and websites. The most common breed problems in the Pomeranian are loose knees or luxated patellas, low blood sugar or hypoglycemia, hair loss or alopecia and heart murmurs. Luxated Patellas are caused by the breed being bred down to such a small size causing shallower joints. Although individual cases vary in severity, many times treatment by rest and supplementation with calcium, MSM, glucosamine, and chondroitin will have Poms "travelling sound" in a couple of months. Surgery is not recommended normally and is very invasive. According to the OFA, 49% of the Poms tested had some degree of looseness in their patellas. Patellas also can shift and change over the life of the dog, depending on age and activity. Hypoglycemia is mostly prevented by not overexercising and letting the Pom have access to food at all times. Again, remember this is a Toy dog. There is no scientifically confirmed singular cause (other than shaving) to hair loss at this time. Heart murmurs are present when a puppy is born and are usually found at a health check. Of course there are many rarer things that can happen or develop in a Pom, as in all breeds of dogs. First off, there is no such thing as a Teacup Pomeranian, no responsible breeder should ever refer to their dogs/puppies as a "teacup". We will have an article posted soon about the subject. Poms ARE TOY DOGS (in Canada they belong to Group 5 Toy Dogs) AND SHOULD BE TREATED AS SUCH.